Everyone enjoys the taste of barbecue, but not everyone is up to speed on how to cook it. This is especially the case when it comes to smoking ribs. Even some of the most seasoned pros are left wondering how to get that perfect, BBQ circuit taste. So how do you get that professional taste and how do you achieve the ideal bark and texture? 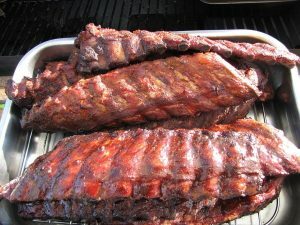 Most importantly, how long does it take to smoke ribs and how the heck do you know when they are done? You may not even realize that in many cases, it all comes down to timing. But even that is not the end all be all of the perfectly cooked rack of ribs. So how long does it take to smoke ribs in a charcoal smoker? 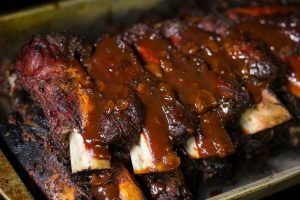 Let’s start by looking at a quick overview of the process of cooking smoked ribs before we move on to how long you should cook them in a charcoal smoker. 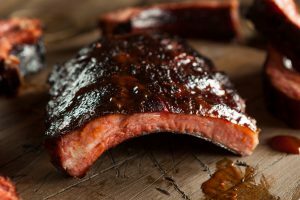 We all love the taste of lip smacking, fall off the bone BBQ ribs, and when done correctly, you never hear anyone complaining about the mess they make. The overall process can be challenging yes, but ultimately oh so rewarding when you see your guests sucking every last bit of sauce off the bones. By following the general process outlined below, you will be well on your way to mastering this skill. For a more in depth look at the process of using a charcoal smoker, you can check out How to Use a Charcoal Smoker here. Ideally, you should barbecue with either lump coal or high-quality briquettes. You should never use lighter fluid or charcoal that contains lighter fluid. If you want to achieve the best-smoked meat, then it’s a good idea to keep an arsenal of lit coals on standby so that your grill will always be at a consistent temperature. Also, never put raw charcoal on an already established coal base. This will create a drop in temperature and will take valuable time to reestablish your smoking temperature sweet spot. Start by lighting your coals using a charcoal chimney starter. Charcoal chimney starters are metal cylinders with air vents that are used for lighting charcoal easier before adding it to your smoker or grill. You can see a list of the best charcoal chimney options on the market here if you don’t already use one. Let the chimney burn for around 15 minutes or so until the coals are ready. Then, simply add the coals to the firebox in the smoker. Another effective method is to light only a handful of briquettes on fire in the chimney and place them on top of the remaining unlit ones inside the charcoal pan. They will gradually light the unlit ones on fire without offsetting the temperature. What Is The Proper Temperature At Which To Smoke Ribs? Start by opening the bottom and top damper of your grill. Spread out all of the lit coals on top of the charcoal grate. Monitoring and adjusting the vents as the ribs are cooking is crucial to ensuring that the temperature stays in the sweet spot for smoking. The ideal temperature is between 220℉ and no higher than 250℉. Your smoker should never get hotter than this. Perhaps your smoker does not have a built in temperature gauge. In this case, you should really consider purchasing a digital meat thermometer that can monitor the internal temp of the smoker. You can check out some top-notch options here. Not knowing the internal temperature of the smoker while cooking is a sure fire recipe for disaster. Once the grill has reached 250°F, replace your cooking grate if you have not done so already and lay your slab of ribs on the opposite side of all of your coals. Place the lid on your smoker and make sure that you put the lid’s open damper directly above your meat. Placing the bottom and top dampers on the opposite sides will help you to create somewhat of a vacuum. This will push oxygen through your coals and help keep them going. Another huge benefit to this method is that it will allow the heat and smoke to pass directly through your ribs giving them added flavor. At this point, the cold is being shocked off of your ribs and the ribs are essentially robbing the smoker of all of its heat. This reaction will cause the grill to settle at around 220°F. This is why it’s a good idea to start at a temperature that is a little bit higher—the temperature eventually decreases anyway. A good rule of thumb to keep in mind is that you can always add more heat; the difficult part is taking the heat away. Do your best to maintain a 220° temperature. This is hot enough to get a deep brown surface and to develop a crusty bark. Most importantly, it is hot enough to melt the collagens and fat. This means that you should keep a constant eye on your smoker. Add more coals if needed when the temperature continues to drop even after adjusting the vents. Have you ever attended a barbecue, and you notice that the cook is constantly poking or flipping the meat and checking to see if it is done? What most people don’t realize is that the best-smoked foods don’t require that. In fact, when it comes to smoking ribs, you should refrain from opening your lid as much as possible—not even to check on or flip them. You are not cooking the ribs over an open fire; you are actually cooking with indirect heat. This means that you have to touch them almost not at all. The secret is to monitor time and temperature. Your main priority should be keeping an eye on and managing your coals and the heat. If you have to open the lid for any reason, remember to close it as quickly as possible. If you have stayed on top of monitoring the temperature and your coals, then you should be able to start opening the lid of your charcoal smoker and checking on the ribs in 4 hours’ time. This is the point at which you should notice that the meat is somewhat pulling back from the bones. Are the ribs done now? Probably not, but knowing if they are done can be a tricky endeavor especially because there isn’t a good spot to accurately place a meat thermometer probe on a rack of ribs. 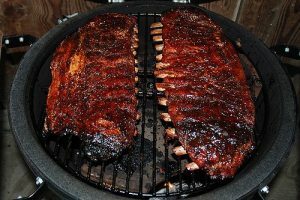 Then there is the fact that ribs come in many different thicknesses and weights and no two smokers or grills are the same. So relying on time alone is not a good way to measure your ribs doneness. The above just underlines the fact of how hard it is to tell if they are ready. So How Do You Tell When They Are Done? Using a good instant read thermometer is a good starting point, and ideally, you would want to shoot for between 190°F and 203°F internally. The problem with using a thermometer on ribs though is that the meat is too thin, and it is too close the bone. Throw in the fact that they vary in thickness from end to end and side to side and well, you get the point. So relying on a meat thermometer as your only means of checking the doneness is just not good enough. If you have worked hard to control your temperature throughout the cook, have kept a close eye on the clock, and think they are close to being ready, here is a sure fire method you can use. Start by picking up the slab of ribs in the middle with a sturdy pair of tongs. It is best to wear a pair of heat resistant grilling gloves while doing this. Now bounce them slightly up and down. You will know if they are done if they bow enough for the meat to start to crack on the outside surface. They should be close to, but not quite, breaking apart when you use the bend test. Your smoked ribs should have a silky texture to them and the meat should be firm enough to not actually break apart. With a little practice, you will quickly get a proper feel for this. At this point, they are ready for the sauce and sizzle to finish the cook. If you are interested in perfectly cooking your smoked ribs, then you have to be very aware of time. While most people assume that there is an exact length of time to cook your ribs, there are a number of different variables at play. Time is just a measuring point to know when you are getting close. 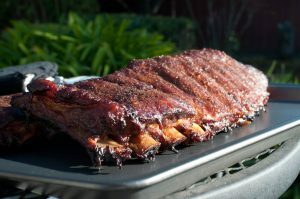 Figuring out the answer to the question, how long does it take to smoke ribs in a charcoal smoker, has a lot to do with how well you are able to maintain your temperature. It also helps to get a feel for what a properly cooked rack of ribs feels like when you are using the bend test. Like most things, this becomes easier with practice. However, in the best-case scenario, your smoked ribs should take no longer than 4 to 6 hours. As always, if you or someone you know find this information on how long does it take to smoke ribs useful; please consider sharing it with your Grilling friends and on social media! If you would like to leave a comment or have useful tips of your own to share on how long does it take to smoke ribs in a charcoal smoker, please do so below. We always welcome your input. You and me both. I had no choice but to smoke ribs that very weekend after I finished writing about them. Hopefully, I was able to get you out of your comfort zone a little bit and inspired you to give smoking ribs a try. Let us know how they come out. Thanks for reading and hope to hear back from you soon. Thank you so much for this article and was actually talking to my wife about grilling or smoking ribs on the grill. I myself love grilling and one of those people that don’t care what time of the season it is. I love the step-by-step advice that you give and will be doing something like this soon using your website!